Visually tell a story about a journey or episode using collage and Food Dye. 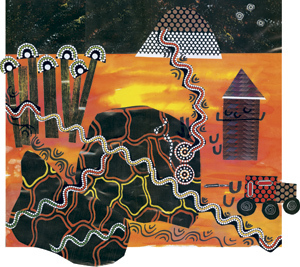 Using the Australian Indigenous Art Papers, create your own story using collage skills and of course, your imagination! Creatively illustrate your story through visuals, creating a striking and unique design. On a scrap piece of paper create some symbols in the style of Indigenous Australian artists that might be included in the story. Use the Indigenous Australian Papers either as a background or cut up and incorporated into a painted background with the symbols created to tell your story. I live near the bush. Each morning and evening a large mob of kangaroos come down from Mt Riddle on to our paddocks. One day we noticed a mother kangaroo and a baby joey near the dam. The mother looked very ill and couldn’t hop too well. The joey stayed close by its mother. We phoned the vet at the Healesville Sanctuary. The vet had a tranquilizing dart gun. It took a long time but he ‘darted’ the joey first and then the mother and wrapped them in blankets and took them to hospital. When the story is complete provide a chart of symbols you have created and their meaning and see if someone in the class can put your story into words based on the symbols you have used.